Alyxx had a week of firsts! A great week of family and work wrapped in one. 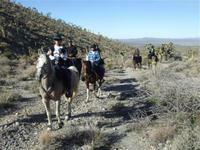 We went straight from a family vacation at Lake Powell to the Virgin Rim Endurance Ride. More than half of the horses on day one and day two were fitted in Easyboots. Easyboots won the first and second day and also received best condition on both days. Alyxx water skies at 2 1/2 years old. Alyxx catches her first fish. Alyxx crews for mom and dad at Virgin Rim. Mom finishes 3rd (Easyboot Glue-Ons) and dad 4th (Easyboot Gloves) on the first day. GE Cyclone gets Best Condition (Easyboot Gloves). Christoph Schork and Dian Woodward tie for first place. Kevin Waters in 5th place. First five horses in Easyboots. Alyxx helps the Duck mark trail. Cyclone and I navigate an ocean of sheep. On the second day I had the opportunity to ride with Kevin Waters and his awesome horse Tahoes Thunder. It was a special day for Kevin as he logged his 20,000 endurance mile. Kevin and Tahoe were first place and best condition. Congrats to Kevin and Tahoe! Kevin and Tahoe lead us out. EasyCare has a new testimonial section on the main website that allows consumers to upload testimonials quick and easy. Log on and submit your Easyboot success story now. All qualifying testimonials receive a free hoof pick! Garrett and Cyclone on the way to a best condition in the Easyboot Gloves. Rob and I are very pleased with how Sqig went in his EasyCare hoof boots in this challenging 80 km ride. The ride is in a dry and rocky part of NSW in Australia with a lot of the course resembling a dry creek bed with large rocks everywhere. I have been riding in Easyboot Gloves and was particularly impressed at the earlier ride, Kiwarrak where we came 1st Lightweight and BC but since we didn't have dome pads for the Gloves I went back to the good ole favorites for endurance - Epics and Bares, that is before the Gloves and Edges. I've got Edges on order so hopefully I'll be one of the lucky first ones in Australia, the first shipment is about to arrive. Sqig has now completed 2080 km, barefoot and booted in his endurance career over 3+ years. It was a beautiful day for riding at Tooraweenah with a light cool breeze and clear conditions. Now if only I can talk the photographer into heading into the more scenic part of the course. All EasyCare Team Members who have direct contact with consumers, practitioners, dealers, mail order companies and wholesalers met as a group today for both a written exam and a hands on discussion. The written exam covered many different topics centered around EasyCare's new product range. The hands on discussion went a step further and gave each team member the opportunity to fit boots, glue boots, prep feet and remove glue-on boots. The goal of these meetings and tests is to be more educated and confident in the products we make and recommend. These meetings help EasyCare get consumers into the right hoof boot, they help EasyCare with product questions and they help EasyCare solve consumer hoof boot dificulties. We discuss the hard consumer questions and the questions/situations we need to get better at answering. I've personally been involved with EasyCare since 1993. Our current team is the best group of people that I've ever worked with. The team works hard, works well together and eagerly pitches in to help each co-worker. It was a successful day, everyone went home more educated. Keep sending your questions and feedback. Let us know what we can do better. 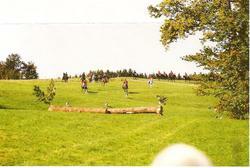 I had the opportunity to start endurance riding when I was a kid and did my first endurance ride in the early 1980's. I rode a horse named Little Fellow Bruce that we purchased from Sandy Schuler and Roger Yohe. As an 11 year old, my first ride was called the Rifle Bite the Bullet 50 in Rifle, Colorado. I remember driving the motor home pulling four horses before I had a driver's license. I remember camping at the Big Horn 100 in Shell Wyoming, catching fire flys at Old Dominion 100 and riding Tevis as a junior sponsored by Bob Walz. Good memories. Over the years I've done some endurance races in incredible areas of the United States. Regardless if you have 50,000 miles, 20,000 miles, 10,000 miles, 5,000 miles or 500 endurance miles under your belt, everyone has a couple favorite endurance events. Of all the endurance rides out there, one of my personal favorites is the Warner Springs Endurance Ride hosted by Terry Woolley Howe, Jennifer Bishop and gang. The ride base camp is located at the Warner Springs Resort outside San Diego. Participants have access to bungalows, hot springs, meals, stocked aid stations, a beautiful trail and wonderful volunteers. 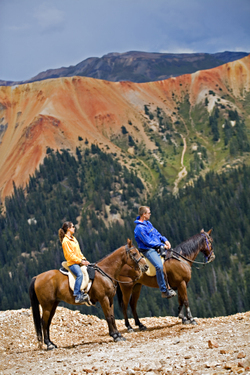 It's more of a vacation than an endurance ride. If you haven't done this event I would highly recommend it! You can't go wrong doing any ride Terry puts on. I plan on bringing several of the new boot styles (Easyboot Glove, Easyboot Edge, Easyboot Rx and Easyboot Glue-On) for people to look over and use to size on their horses. I'll also bring several fit kits and would love to help you fit your horse in the new boot styles. Size your horse now, our first large shipment of the new boot styles is weeks away. I was lucky enough to get a couple corrals, look for me there. I attached a photo from Death Valley that shows a little boot demo. Daily views on this blog have gone through the roof! Over the past 40 days traffic on this blog has increased on average of 700%! Pretty crazy. Interest in the new products lines has been incredible and we have seen lots of activity from the following forums to name just a few. Comments are also flowing in faster than I can answer them. Be patient I'll get to each comment as soon as possible. Thanks for the interest in the new EasyCare product lines. 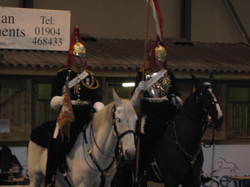 We are looking forward to helping more horses in 2009! 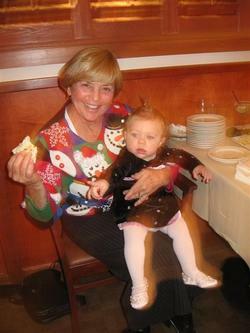 EasyCare would like to wish everyone a Happy Holiday Season and a healthy, prosperous 2009. I would like to extend a special Thank You to all our valued customers, dealers, distributors, vendors and employees. 2008 was EasyCare's best year since 1970! Thank you for being part of our success, we look forward to good things in 2009. EasyCare will be closed for the Holidays from December 22-January 4. We will be back in the office January 5th. The Easyboot Glue-On shell has been a great project and has changed my view of hoof boots tremendously. The flexible upper of the glue-on shell adapts to different shaped feet and most often fits like a second skin over the hoof. The slim profile of the shell adds very minimal to the width of the hoof and very little to the front of the hoof. In my opinion it's the least obtrusive full coverage horse boot available. Reaction to the Easyboot Glue-On has been fantastic but consumers want the features of the glue-on with out the glue process. The Easyboot Glue-On with Gaiter is the answer. The gaiter is designed to attach to a glue-on shell and the boot can then be used on the hoof without glue. The design of the glue-on shell still stretches and hugs the foot while the addition of the gaiter keeps it on the hoof rather than the adhesive. No buckles or straps make it quick and easy to apply and remove. Over the past 4 months I have put several hundred miles on different horses fitted with the Easyboot Glue-On with Gaiter. Performance with the gaiter is very similar to when the shell is fitted with an adhesive. Weight is minimal, bulk is minimal and they stay in place. Yes, it looks way too simple but the design works better than I ever imagined. 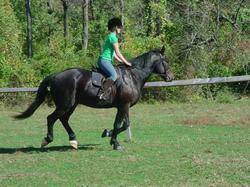 Lisa and I did a ride this afternoon with three different hoof boot designs. 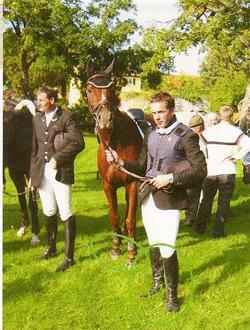 One horse was fitted with Easyboot Glue-On's in the front and Easyboot Glue On's with Gaiter in the rear. 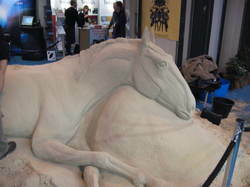 The other horse had Easyboot Glue-On's with Gaiters in the front and Bare's in the rear. The majority of the three hour ride was trotting and cantering with a bit of walking. Of the three designs the Glue-On with Gaiter performed the best. I believe the Glue-On with Gaiter will end up being the most popular boot design manufactured by EasyCare. I have attached a quick story that makes me proud of our Team Members, our dealers and EasyCare products. Dawn and Jay you are amazing! "I don't know what more to say than THANK YOU EASYCARE! Dawn Merrill (Team Easyboot Member), Jay DeHart (Team Easyboot Member and Easycare Dealer) and myself, also a Team Easyboot Member spent yesterday afternoon trimming and booting these four horses that were obviously abused. They were confiscated by our local Sheriffs department from the owner and brought to the Bitterroot Humane Society in Hamilton, Montana. When we got there the vet was there making these guys more comfortable. It all started when Dawn and I went for a local trail ride here in the valley on Friday, August 1st. 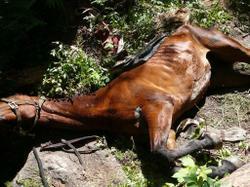 7 miles in we came upon a downed horse that was left to die on the trail. After failed attempts by both Dawn and I we decided to go get help. Dawn and a neighbor rode back the next day and after over 10 hours were able to get the horse to walk out of the mountains (with the comfort of Dawn's Bares). Now all four horses are back together and safe for the moment. 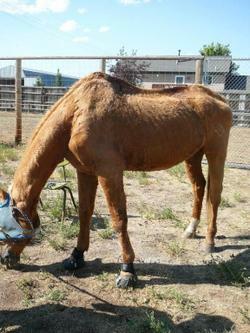 The Humane Society was shocked and so grateful to Easycare for their generosity in donating the boots for these horses. NONE of the employees knew what we were putting on their feet and asked alot of questions about the boots. 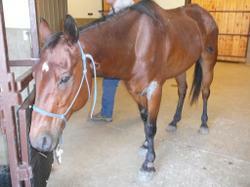 I know this will open more doors for horses and their owners as for an option to shoeing and rehabilitation. Did I say THANK YOU EASYCARE?????? I know if these horses could talk they would be thanking you too." I find it very weird that the two men (Neel Glass and Bob Walz) that were behind two of EasyCare's most successful product lines, passed away in a month's time. I’m very sorry to hear the news about Bob Walz. Bob was a great horseman and invented several items that are still being used in the sport of endurance today. I’ll remember Bob for many reasons. 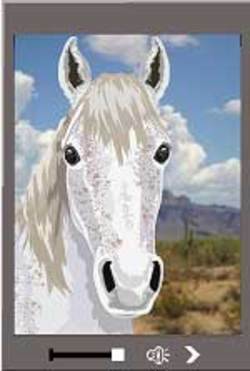 Bob was a Tucson resident back in the early 1980's when my family started riding endurance. We traveled to many rides together, and often conditioned horses together. At over 6'5" Bob had some big feet and needed a stirrup to support his clod-hoppers. Being a great metal fabricator, Bob came up with the E-Z Ride Stirrup for his own needs and then started selling them to all his endurance friends. Bob was also an incredible diesel mechanic. In the mid 1980's, Bob removed the diesel engine from a large dump truck and retrofitted the engine for his ¾ ton Chevy. He then fabricated several diesel tanks that carried over 150 gallons of diesel. His truck and fuel tanks were the envy of every endurance rider. The truck could not only pull any trailer, but it had an incredible range. Most production diesel trucks are now similar to what Bob put together in his garage. Bob got in a bit of trouble with his truck in the late 1980's. Bob would drive the truck across the border to Nogales Mexico in order to fill the 150+ gallon tanks with cheap diesel fuel. Diesel was $.40- $.60 a gallon back then and Bob was always looking to save money. After many successful trips to Mexico, Bob was put in a Mexican jail and the truck was impounded. 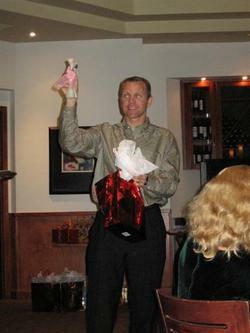 Bob spent several weeks in the Mexican jail as many local Tucson friends and endurance riders rushed to get him out. With a bunch of effort from my family and many others, Bob was released. Bob had some wild stories after the release. Every Tuesday night at the jail was “gringo night” and all the gringos were beat up. After a couple of beatings, Bob made the appropriate friends. Although Bob was released they didn’t release his truck. Bob went back to Mexico, cut open the impound gates and drove the truck back to the USA without stopping at the border. Several years later my Dad purchased the truck from Bob, we still have it. Bob was my sponsor twice at the Tevis Cup back when I rode the Tevis as a thirteen year old. When you ride 100 miles with someone, you really get to know them. 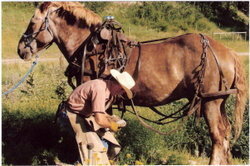 Bob helped to get me and my horse through the Tevis twice. 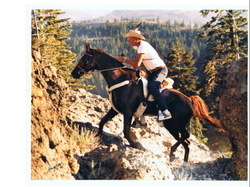 Bob was scared of riding in the dark and my horse loved ripping down the California Loop below Foresthill. I can still remember riding down the trail in pitch black and Bob yelling, “Whoa Bruce, Whoa Bruce”. It went on for hours. 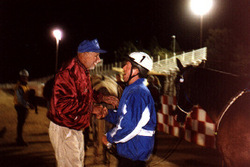 In the mid 1990's, I approached Bob and offered to purchase his E-Z Ride Stirrup and Equine heart rate monitor business. 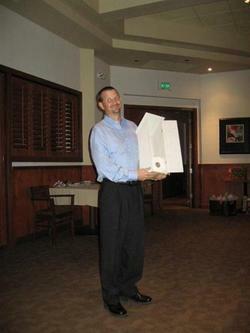 Bob transported all the equiment down to Tucson from the Auburn area and trained the EasyCare staff. The E-Z Ride Stirrups have been a huge success and are used by endurance riders around the globe. Thanks for the memories and contributions! I'm very sad to report the passing of Dr. Neel Glass on April 27th, 2008. Neel was 83 years old. 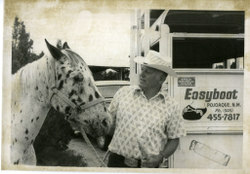 Neel Glass invented the Easyboot in 1970 and was an avid horseman and endurance rider. Neel worked as a nuclear physicist at the Los Alamos Laboratories. He was one of a very small group that developed the atomic bomb. 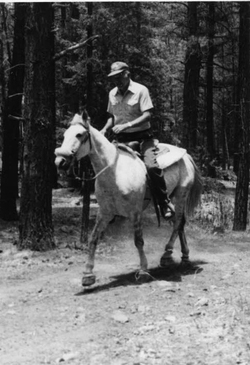 Neel completed the Tevis Cup and the 1976 Pony Express horse race. Neel's hoof boot creation is still going strong 38 years after the original Easyboot was invented. As EasyCare continues to develop and test new hoof boot designs we often remark how great the original Easyboot model was. Neel was a brilliant man and was way ahead of his time. Neel was practicing and writing about natural hoof care 20 years before the horse industry was ready. I would personally like to say thank you to Neel. Thank you for not accepting the available hoof care options. Thank you for mentoring me. Thank you for everything you have done for each and every horse. It's aways exciting to hear people talking about our hoof boots! This past Sunday chatter about EasyCare was found on the ABC News! Click here to read more and watch the news clip! Happy viewing! We have added a Team Easyboot Event Calendar to our website. This way you can see events members will be attending. This is a great opportunity to seek their help with your boots or ask questions. The calendar will be updated frequently. So be sure to check back often. We've recently added a new tool to our website. You can now rate EasyCare's hoof boots. Each boot page now has a product rating on it. Just click on "Product Rating" to see what others have to say or to add a comment yourself. It's that simple. So take some time to add your comments if you haven't already. We'd love to hear from you. We have made a couple changes to the EasyCare home page. Check out the new look at www.easycareinc.com. Granite Chief has not only logged several thousand miles in EasyCare hoof boots but he is now our online spokeshorse. If you're curious, a spokeshorse is a horse who speaks for another or for a group. It's been a while since we've run a blog contest so we thought this is the perfect time to start a new one. All you have to do is answer the below question correctly and you could win one of these Easyboot bags. These bags are great! They clip onto your saddle and can be used to store an extra Easyboot, Epic or Bare boot-- or you can stash your lunch or other goodies to carry with you on a ride. Question: What EasyCare hoof boot is on the horse in our current national advertising? Our ad campaign runs in the following national magazines: Trail Rider, Trail Blazer, Horse and Rider, Horse Illustrated, Equus, Western Horseman, The Perfect Horse, Holistic Horse, Endurance News. Email us the correct answer and you will be entered in the drawing to win. Limit of one entry per email address and household. Entry deadline: April 15, 2008. Winners will be announced May 1st, 2008. Be sure to check out EasyCare's Video Blog! This is a great place to see our hoof boots in action. Not quite sure if you want to purchase an Easyboot Epic or an Easyboot Bare. Perhaps checking out these horses in what keeps them happy will help make your decision a bit easier. Tucson, AZ – March 5, 2008 EasyCare is seeking a Graphic Designer that will work directly with the Marketing Director to conceptualize, design, and produce promotional materials such as: catalogs, flyers, mailers, advertising campaigns, brochures, logos, signage, packaging, web graphics including regular website updates and maintenance, tradeshow displays, CD-ROMs and whatever else may be needed. Benefits include medical, dental, 401K and paid vacation and holidays. Please send resumes with salary requirements to admin@easycareinc.com No Phone Calls. No Agencies. This year brings us some revised rules so be sure to check them out! Last years contest brought us 83 riders who rode 19,011 miles. Click here to see the final results. We're off to such a great start this year! Let's see if we can pass up the 2007 record. 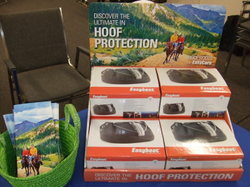 So be sure to join in the fun and enter EasyCare's 2008 Hoof Boot Contest! Here's a sneak peak for ya! 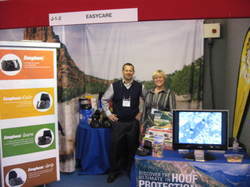 Karen and Brian chat about new EasyCare products and product improvements at WESA in January. Check it out! Stay up to date with EasyCare! Subscribing to the EasyCare Newsletter will help keep you in the loop. Also be sure to check out all of our blogs. There's always interesting tidbits that are sure to be helpful or tell you what's next! We are having a very successful show at BETA and have had the the opportunity to meet two or three great new wholesalers who should really help us in the European market. The Easyboot Edge has been a hot topic. Here are a couple photos from the event. We've added an EasyCare Photo Gallery to our website! 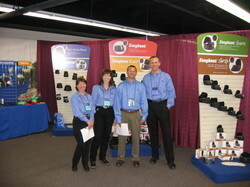 Be sure take a look at all the great pictures of our hoof boots in action. There's even some instructional images you're sure to find helpful. Be sure to check it out! EasyCare has been very lucky to have established a working relationship with Pete and Ivy Ramey of Hoof Rehabilitation Specialists. For those of you who don't know Pete and Ivy, I would recommend that you either attend one of their clinics, read Making Natural Hoof Care Work For You or watch the 10 disc Under The Horse DVD. 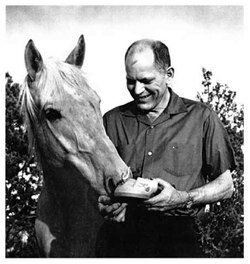 I believe that Pete and Ivy are among the top groups and individuals that have advanced the barefoot natural hoof care movement to main stream horse owner. They are truly dedicated to helping horses. 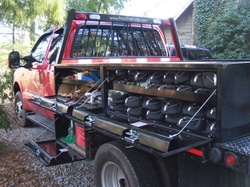 Attached is a photo of Pete's truck loaded with Easyboot Epics and Easyboots. Pete is a firm believer in using boots during the transition stage. EasyCare has a great program that allows hoof care professionals to "Fill Your Truck" with hoof boots at reduced cost. Hoof Care professionals that would like to know more about the program should contact Debbie Schweibert at 800-447-8836 ext 2224. Have you made your plans to attend the Association for the Advancement of Natural Horse Care Practices first "Reno Symposium for the Humane and Natural Care of the Horse?" This three day forum will feature a superb lineup of the world's foremost experts in their fields, sharing new, unpublished, cutting-edge information of vital importance to your horse's well-being and performance. Our very own Karen Chaton is one of the scheduled speakers! 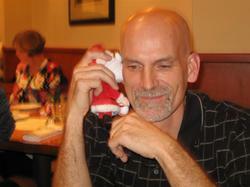 The AANHCP Conference is in Sparks, NV at John Ascuaga's Nugget Hotel and Casino Sunday 2/24 - Tuesday 2/26. Click here for complete information about the Symposium and attendance registration. This is an event you won't want to miss! Stay up to date with all EasyCare happenings by subscribing to our newsletter! And don't forget to check our events page to see where we'll be next! EasyCare's competitive hoof boot upgrade program continues to do very well. We have been working on a new area of our website that will list these second hand boots for sale. In addition it will give people the opportunity to leave feedback and comments on each boot design. It will essentially be a second hand hoof boot store. We currently have Swiss Horse Boots, Marquis, Simple Boots, Renegade Hoof Boots, Davis, Bosana and Turf Kings. 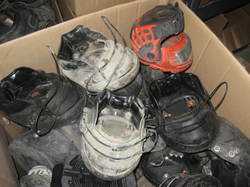 All boots will be sold as singles and EasyCare will offer no warranty on these second hand boots. All sales will be final. The application deadline for the EasyCare Scholarship with Equine Sciences Academy is quickly approaching! If you have been thinking about applying now is the time to get your paperwork completed and submitted! Don't forget all applications are due to EasyCare Friday February 15, 2008. Click here to learn more about the application process. I've been a huge fan of Crocs and their EVA shoes for many years. They have an amazing product and clever marketing. One of the first pair of Crocs I owned gave me the original idea for our comfort pads. 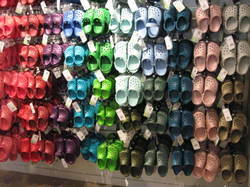 I spent several hours today in a Crocs corporate store looking at all the new designs. The visit gave me some ideas for new directions on our hoof boot lines. 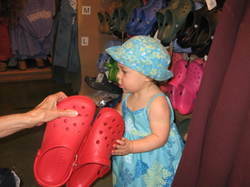 If you own a pair of Crocs do yourself a favor and visit the website to study up on the new designs. If you don't own a pair of Crocs get online and purchase a pair. They will be the most comfortable pair of footwear you will ever own. It's always frustrating to me as a small business owner to see the many distractions that happen on a daily basis. These distractions take companies away from what they actually do to pay the bills and make every company less efficient. Here is a quick little article that may help you eliminate these distractions from your work life. 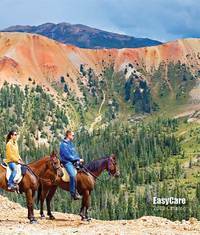 The 2008 EasyCare Catalog is interactive and now online. It's just one click away! So be sure to check it out! EasyCare is proud to offer scholarships geared towards students pursuing careers in the natural hoof care industry. We are now accepting applications for a scholarship with Equine Sciences Academy through February 15, 2008. Click here to learn more about the application process. Remember the deadline is Friday February 15th. So if you are interested in applying be sure get your paperwork in! EasyCare will be adding a nice little point of purchase display to help dealers showcase product better for the 2008 season. The display will hold 8 of the smaller boot sizes (Pony-3) and is designed to sit on a counter or shelf. Space in a retail store is difficult to come by so we decided against a free standing display. We plan on doing several dealer promotions in the next couple months that will include the point of purchase display with an 8 or 16 boot dealer order. The point of purchase display should be available to ship in early February. When you're looking to purchase new hoof boots it is very important to get the proper size. Make sure you've measured your horses hooves accurately. Need a little help measuring? No problem! 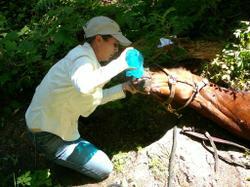 Be sure to visit our page on how to properly measure your horse. If you're still unsure of what size boot you need after doing measurements or just want some confirmation, visit our Hoof Boot Calculator page. This new tool will help you select the proper boot size! You just need to plug in your horses measurements! So breathe easy and check it out today. We're always adding new things to our website. So be sure to visit the EasyCare website often! A new year brings a new EasyCare Hoof Boot Contest. Be sure to fill out your application for the 2008 EasyCare Hoofboot Contest now!!! The 2007 Contest brought us 81 riders riding over 19,000 miles. That's an incredible turn out. Be sure to join and lets see what 2008 will bring! The EasyCare staff will return to work on Monday 1/7/08 after a two week holiday break. We have taken a two week break at the end of each year to give every EasyCare team member a break from the work environment and to spend quality time with family and friends. We have big plans for 2008. Here is a short list of what you can expect from EasyCare in the upcoming year. 1. Products. We will be introducing a new gaiter for the Epic, Bare and Grip. We are also working on two new riding boots and a therapy boot. All three should be launched in 2008. 2. Dealers. We have some exciting new programs for our dealers. Dealers can expect many different specials during the year. In addition we have a great new point of purchase display that will come fully stocked with boots. 3. Team Easyboot. We have big plans for Team Easyboot. This incredible group of people will be huge resource for everything from new product testing to spreading the EasyCare Hoof Boot message. 4. Trade shows and events. 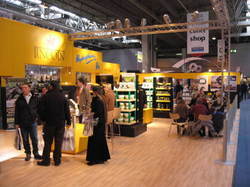 We have a long list of trade shows and events to attend in 2008. 5. Customer Service. EasyCare will be putting a renewed emphasis on customer service in 2008. Expect even better customer service via phone, e-mail or in person. 6. EasyCare catalog. The 2008 EasyCare catalog is done. See a PDF version here. Request one via mail here. 7. Newsletter. Stay informed with monthly specials, new product info and the latest in natural hoof care with our newsletter. Sign up for the newsletter here. 8. The EasyCare website gets better and better every day. It's constantly changing. Check back often to see whats new. Thanks for the support in 2007. We hope to see you on the trail or at an event in 08. New EasyCare Trivia Coming Your Way!!! If you're a fan of trivia games then you won't want to miss out on the new EasyCare Trivia Contest. Stay tuned to the January newsletter for your chance to win a pair of hoof boots. Remember you'll find all the trivia questions there. So if you are not already a subscriber click here to sign up. You'll find the answers to our questions on our website. Submissions with the correct answers will be entered into a drawing for a pair of our newest hoof boot... The EASYBOOT EDGE!!! The contest will run from January thru March with the lucky winner being announced in May. So be sure to check out the January Newsletter and get your detective juices flowing! Have fun and happy searching!!! Here are some great photos of Old Mac's in action! Team Easyboot member Christoph Mentz sent these to us. 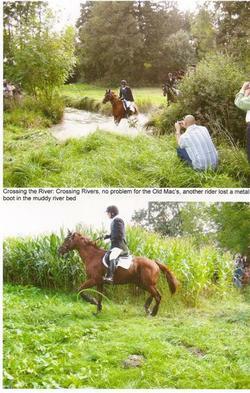 He's a member of the hunting community in Germany and has seen first hand at how helpful Old Mac's are. We love hearing about how well our hoof boots have done during an event. Check out these photos of this new Team Easyboot member and his horse at play. 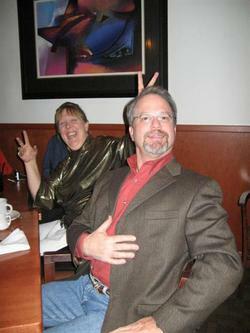 The annual EasyCare Christmas Party was Friday night. It was a fun time to gather together outside the office. 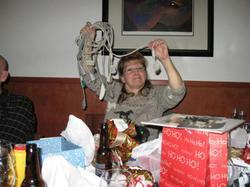 We got some great pictures while playing the White Elephant game. Some gifts got stolen so many times it was hard to remember who actually opened it in the first place. A popular and frequently stolen item... an EasyCare coffee mug. Of course there were some that didn't get stolen at all like the variety pack of cords which we referred to as "IT Jewelry"! The EasyCare Team sure does know how to have a good time! The 2008 EasyCare product catalog is complete and at the printers. It will be mailed to all EasyCare dealers on 12/21 and should arrive shortly after the holidays. It will be available to ship to consumers the week of 1/7/08. The catalog is a large group effort from many of the EasyCare team members and ends up having hundreds of hours invested. 1. Video clips that give instructions on boot fitting and repair. 2. 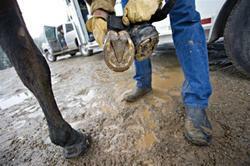 Informative articles about keeping a barefoot horse. 3. Testimonials about what our hoof boots have done. 4. Blogs that provide helpful tips and the latest updates. 5. Dealer Search is now located on our home page. Here is a quick glimpse of the 2008 catalog cover. Guess the location on the photo. Do you have a special event involving horses and would like to request a donation for sponsorship from EasyCare? Click here to visit our guidelines page and fill out our donation request form. Hope everyone has a wonderful holiday weekend with family and friends. 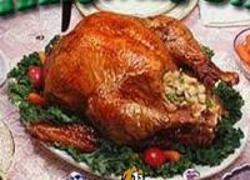 Enjoy in the festivities but remember that Turkey Day is usually the start of the extra weight added to the middle over the winter. Here is a neat calorie calculator that will show you how far you need to walk Friday morning in order to walk off the feast. I had the opportunity to attend a private speaking engagement by Michael Gerber, author of the E-Myth. It was an inspiring morning and really drove home the importance of systematizing the operations of a business in order to focus on what the business does best. Most businesses are like a ship without a sail when they don't have systems and employees who manage the business with systems. Without systems, daily challenges create chaos preventing team members from focusing on the customer and the product that keeps the company in business. I learned a great deal and was refreshed to see that EasyCare already has a great deal of the principals discussed in the E-Myth in place. 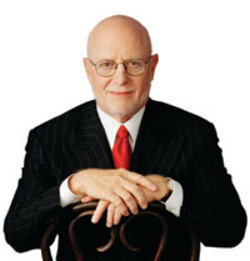 One of my goals for 2008 is to sharpen our systems so we can focus on product development and servicing our customers. The 2008 EasyCare Calendar is officially finished and available. One of these fabulous calendars will be included FREE with any order while supplies last. Make sure to get yours now! 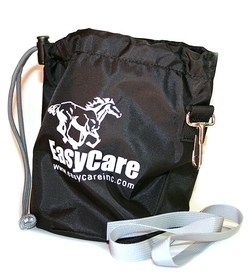 Tags: 2008 EasyCare Calendar, EasyCare, Inc.
Have EasyCare hoof boots helped your horse? Why not share your story with us? Sharing your story gives you a chance to win a free pair of Easyboot Epics! Not to mention we love to hear what our hoof boots have done to help your horse. Be sure to check out our growing library of testimonials, and think about sending us yours if you haven't already. Click here to read about how Easyboot Epics helped Martha Masiello's horse Squire transition to a healthy barefoot lifestyle.